The change aims to bring Washington into compliance with the federal Real ID Act, which requires all states to mark identification documents that do not comply with the federal law. Under Legislation signed (app.leg.wa.gov) by Gov. Jay Inslee, DOL expects to be in full compliance with the REAL ID Act by fall 2018. Over the next two years, all Washington residents will have to make a choice about their identity documents. By October 1, 2020, standard driver licenses and ID cards will no longer be an acceptable form of identification for boarding domestic flights and entering some secure federal facilities, like military bases and nuclear power plants. DOL’s enhanced driver licenses (EDLs) and enhanced ID (EIDs) cards are Real ID compliant, and valid for travel as are passports, permanent resident cards and military IDs. An enhanced driver license or ID card is completely voluntary and optional. Some commonly needed documents to get an EDL/EID are certified birth certificate, U.S. passport or military ID. A full list of document options for obtaining an enhanced driver license or ID card is available on the DOL website. (OLYMPIA) – The U.S. Department of Homeland Security (DHS) announced all Washington state driver licenses and ID cards can be used for all federal purposes, including commercial air travel, under a REAL ID Act compliance extension that runs through October 10, 2018. The Department of Licensing (DOL) expects to be in full compliance with the REAL ID Act by fall 2018, under Legislation signed by Gov. Jay Inslee earlier this year. DHS has said states that have been determined to be compliant will not be subject to REAL ID enforcement at airports or federal facilities until October 2020 under current federal regulations. “This extension gives Washington residents about three more years to decide if they will need a new type of identification. Many already have acceptable federal identification,” DOL Director Pat Kohler said. When the REAL ID law is enforced in October 2020, no one will be required to get an Enhanced Driver License or Enhanced ID Card. A variety of identification documents are acceptable for federal purposes under REAL ID, including U.S. passports and passport cards, military or military dependent ID cards, valid foreign passports or legal permanent resident cards and state-issued enhanced driver licenses or enhanced ID cards. Gov. Jay Inslee signed into law this week a measure that brings Washington state into compliance with the federal REAL ID Act, giving residents likely until 2020 before the new federal ID requirements will affect travelers with a Washington driver license or ID card and those seeking entry into some federal facilities and military bases. That’s because the new law is expected to gain our state a REAL ID compliance extension that will allow a standard Washington driver license or ID card to be used for all federal purposes, including boarding commercial flights until then. Washington joins the ranks of about 20 other states with compliance extensions while they work to implement the federally-mandated changes. Enhanced Driver Licenses and ID cards will become Washington state’s federally-compliant ID document for domestic air travel and entry into secure areas of federal facilities, but it’s important to remember there are other types of documents that are already valid for federal purposes now and into the future. You may already have one: U.S. or foreign passports, U.S. Passport Cards, military ID, permanent resident cards, Transportation Worker Identification Credential (TWIC card), and several other documents. A complete list is available here. The new law also lowers the price of state-issued Enhanced Driver Licenses from $108 to $78 starting in late July. Washington state is currently under a temporary compliance extension and federal officials were provided a formal request for a compliance extension this week after Gov. Inslee signed the legislation into law. DOL is aware of the Department of Homeland Security’s plan to begin posting signs in airports across the country announcing the January 2018 date for requiring a federally compliant form of identification to board domestic commercial flights under the REAL ID Act. It is important for all Washington residents to know that a regular Washington state driver license or ID card will be acceptable for commercial air travel until at least the 2018 deadline. There are many options for federally-compliant ID, including passports or passport cards or DOL’s Enhanced Driver License/ID Card. Washington residents have time to research their ID card options and determine if they already have a federally acceptable document or need to get one. Legislation approved by Gov. Inslee to bring Washington state into compliance with the REAL ID Act was sponsored by the Chairs of the House and Senate Transportation Committees this week for consideration by the Legislature. Washington state law is not currently in compliance with REAL ID Act standards. The legislation, similar to a plan DOL brought forward two years ago, will repeal current state law prohibiting DOL from complying with the REAL ID Act, give DOL the authority to add federally required markings to our state’s standard driver licenses and reduce the cost of enhanced licenses and ID cards for a period of four years. If this proposed legislation becomes law, under current federal standards, our state will likely be granted a REAL ID compliance extension that will allow a regular Washington driver license or ID card to be used for all federal purposes, including boarding commercial flights, until October 2020. Here are a few types of ID documents that are valid for air travel and other federal purposes: U.S. or foreign passports, U.S. passport cards, U.S. military ID, permanent resident card, tribal-issued ID cards from federally recognized tribes, Transportation Worker Identification Credential (TWIC card) and several other types of identification. A complete list is available at the Transportation Security Administration website. Joint Base Lewis-McChord (JBLM) recently announced new ID requirements for unescorted visitor access at that base and the Yakima Training Center (YTC). These facilities will begin complying with the Federal Real ID Act on April 1, 2016, which means a standard Washington driver license or ID card will not be accepted for entry. U.S. Passport or U.S. Passport Card. Permanent resident card or Alien Registration Receipt Card (INS Form I-551). Foreign passport with a temporary I-551 stamp or temporary I-551 printed notation on a machine readable immigrant visa. Foreign passport with a current arrival-departure record or foreign passport with INS Form I-94/I-94A bearing the same names as the passport and containing an endorsement of the alien’s nonimmigrant status, if that status authorizes the alien to work for an employer. Employment authorization document that contains a photograph (INS Form I-776). U.S. Government issued, authenticated Federal PIV credentials. For anyone under 18, a school identification card with a photograph. This change affects companies with employees who need unescorted access to JBLM or YTC. It also impacts people who need visitor passes for unescorted base access to visit friends, family, the museums, hospital or other locations. Washington is one of five states whose standard driver license is not in compliance with the federal law. 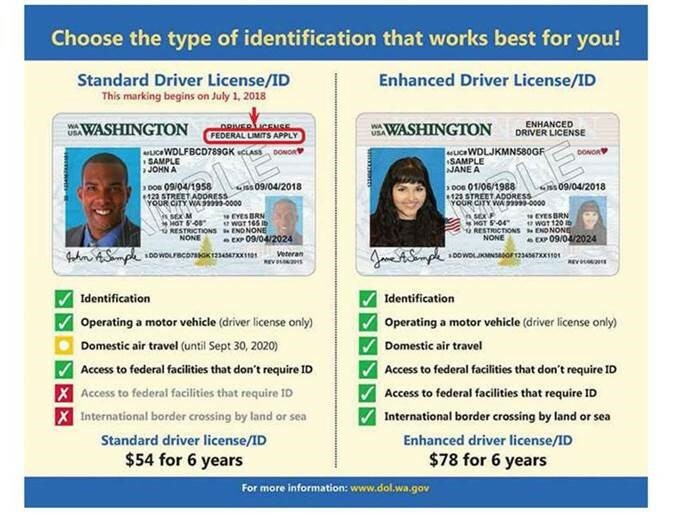 Washington’s Enhanced Driver Licenses and Enhanced ID Cards are Real ID Act compliant and require proof of U.S. citizenship, identity and Washington state residence. Learn more about obtaining an Enhanced License or ID at the Department of Licensing website. Learn more about the new requirement by contacting the Lewis Visitor Center at (253) 967-4794, McChord Field Visitor Center at (253) 982-2588, or YTC Police Desk at (509) 577-3236. Visit the Department of Homeland Security Website for information about the Real ID Act. You are currently browsing the archives for the Real ID category.